. Published on Thursday, May 3, 2018 . Preparing food as a college student can take up a lot of time (that we do not have). When cooking or baking for one, it can be difficult to estimate how much food you really need. Luckily, mug recipes (small, portioned-for-one meals and desserts) exist. Here are some of our favorite quick and perfectly sized recipes to whip up with a microwave and your favorite mug. Move over, blue box Kraft, because this mac-for-one mug is our new go-to. Elbow macaroni, water and cheese are all the ingredients needed for this mug of cheesy goodness, and it can be prepared in just about five minutes! The recipe calls for shredded cheddar cheese, but don’t let that stop you from adding in a blend of your own favorite cheeses! Yes, we said mug pizza. Ditch the DiGiorno and have your own pizza party by preparing this insanely easy pizza. Flour, baking powder, baking soda and salt make up your crust, and marinara, cheese and any other toppings of your choice make this a perfect, customizable lunch or dinner when you’re on a time crunch. This recipe can be exactly what you want it to be because you can customize it with your favorite rice, beans or other burrito toppings. 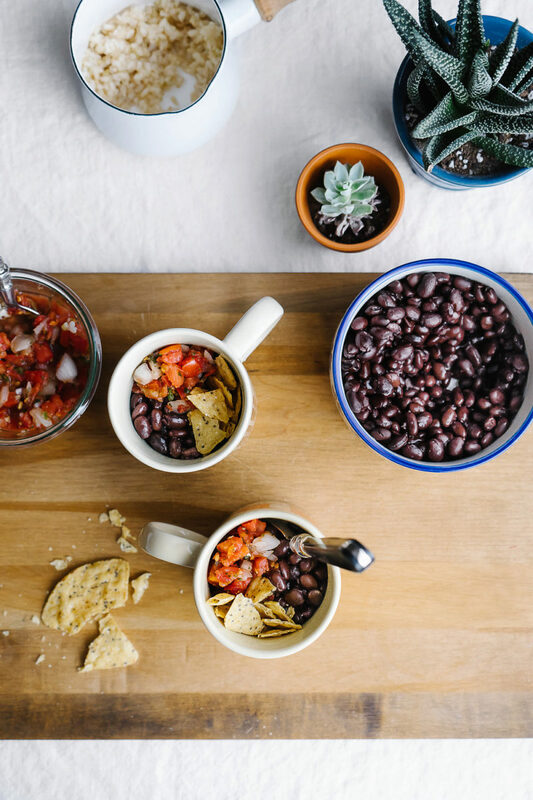 You won’t miss the tortillas, because this mug calls for corn chips that will add the perfect crunch to your meal. This alternative is much cheaper and efficient than taking a trip to your nearest Chipotle. Perfect for spring, this light and fruity mug cake can be whipped up in a jiff. The basics you may already have in your pantry are needed for this recipe, but what sets it apart is the fresh strawberries in and on top of this adorable dessert. All ingredients are placed directly into the mug, so there is little to no clean-up involved! Where are our peanut butter fans at? We are practically drooling at this oozing peanut butter chocolate goodness! This recipe calls for a few more ingredients, but it is worth it because the peanut butter pie mousse to top it off takes the cake (pun intended). This perfectly rich cake can be whipped up in about five minutes, how can we say “no” to that? Not all mug dessert have to be cakes! Get your chocolate fix with this decadent mug brownie. The best part about this recipe is that you can make adjustments to it, such as switching the water out for coffee or microwaving it for less time to produce a gooier brownie. For added sweetness, throw on a scoop or two of your favorite ice cream! Which mug recipe has your name written all over it? Let us know by using the hashtag #CampusCropChat on Facebook, Instagram and Twitter. Don’t forget to follow us on Snapchat @ASICPP!